Last week, the U.S. Environmental Protection Agency (EPA) released a new report summarizing air quality and emissions trends in the United States. Titled, “Our Nation’s Air,” the report shows an impressive decline in local air pollutants such as carbon monoxide (CO), lead, sulfur dioxide (SO2) and particulate matter (PMx) from 1990 to 2015. But while EPA touts the Clean Air Act as the reason for declining emissions levels across the board, it fails to credit the real key factor behind this decline: increased use of natural gas. From 1990 to 2015, total U.S. natural gas consumption increased by over 42 percent, from 19.1 trillion cubic feet (Tcf) in 1990 to 27.3 Tcf in 2015. According to the EPA, during this same period levels of SO2 dropped 85 percent and carbon monoxide declined 77 percent, while concentrations of lead, nitrogen dioxide (NO2) and ozone (O3) dropped 99 percent, 56 percent and 22 percent, respectively. Admittedly, the increased use of natural gas was not the sole driver of this emissions decline, but looking deeper, it has had a tremendous impact on reducing air pollution. Since the mid-2000s, fracking and horizontal drilling have allowed companies to unlock vast reserves of natural gas that were previously out of reach. As natural gas production quickly climbed, electric generators increasingly relied on the fuel due to its low cost and reliability, as well as its lower emissions profile. According to the U.S. Energy Information Administration (EIA), natural gas accounted for about 18 percent of the total electric generating mix in the United States in 2005. By 2015, that share nearly doubled to 32 percent of the total mix. Today, natural gas is the largest power source in the United States. Moreover, during this period carbon dioxide emissions declined by 21 percent, reaching their lowest level since 1993. 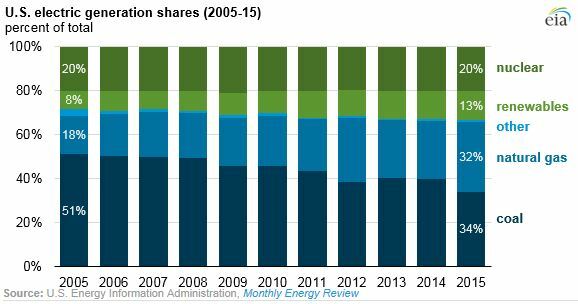 Comparing this uptick in natural gas use with the EPA report data, similar trends appear. According to EPA, total nitrogen oxide (NOx) concentrations we cut almost in half from 20.3 million tons in 2005 to 10.4 million tons in 2016. Additionally, NOx emissions from stationary fuel combustion decreased from 6.3 million tons in 2005 to 2.8 million tons in 2016 – a decline of about 59 percent. 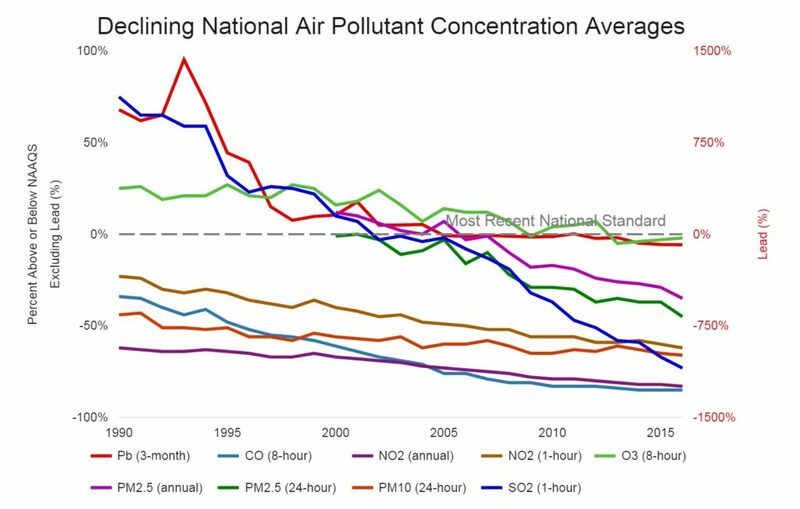 As a contributor to smog, such a massive drop in NOx is extremely beneficial to air quality and health. More impressive still is the impact increased natural gas use has had on SO2 concentrations. In 2005, total SO2 emissions were about 14.5 million tons, according to the EPA report, with stationary fuel combustion making up the lion’s share at 12.7 tons. By 2016, SO2 emissions from stationary fuel combustion declined over 84 percent to just 2 million tons. During this same period, concentrations of fine particulate matter (PM2.5) and volatile organic compounds (VOC) dropped by over 27 percent and 37 percent, respectively.